Today dolls, I've got a double review for you. If you read the makeup and outfit details below my outfit posts, you would know that I barely use makeup for my skin. On a normal day, I use a basic moisturizer but on special days for an event or an occasion, I use a stick concealer and a compact foundation. 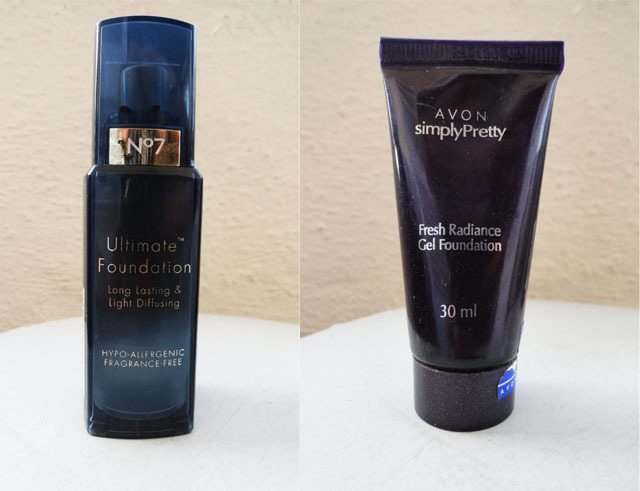 So when I got the chance, I decided to give a try to a liquid and gel foundation, review both of them for you and recommend which one you should use. Both of these products were gifts, so I do not know what their price range is in the current market. Boots No.7 - It comes in a translucent blue 30 ml pump dispenser bottle with gold detail and lettering. The packaging has a very neat look to it and I love the pump dispenser because it is so hygienic. As stated on the bottle, it is fragrance free so you don't have to bother about any odd smell from the product. Avon Simply Pretty - It comes in a tiny 30 ml metallic grey-blue tube with silver lettering. The tube is tiny enough to toss in your bag so thats great. I'm not sure about how hygienic the usage of tubes are for makeup but I think pump dispensers are much better in this respect. - The packaging and the pump dispenser are amazing - It gives out just enough product. - The shade is a great match for my skin tone. - Give a natural look, no cast is left behind. - I'm not sure where Boots products are available in Mumbai or even online. - Creamy texture because of the gel probably. If you want light to medium coverage, just the gel foundation would suffice. - It isn't the fault of the poor foundation but it was a shade too light for me. - It left a white cast which I really disliked. - It doesn't blend in very well making it stand out and look unnatural. If you do manage to get your hands on it on a trip abroad or via a website, do pick up the Boots No. 7 Ultimate Foundation - It definitely wins this battle ! The Avon one isn't bad but I'd suggest you try many other options instead of this one. I do hope you liked the review! What is your makeup routine for your skin for an occasion ? The month of May is coming to a close ! Soon enough the heat will subside and the rains will be here. See you on the other side with a new outfit post! Have a fab weekend dolls! Summer lovin' happened so fast. It is almost the end of May. Just a few weeks more and we enter the monsoon season. Can you believe how fast the time has whizzed by ? It seems like just yesterday when I celebrated Easter. I can remember New Years 2012 like it was last week. My dad always told me, time flies when you're having fun. It's true. Sometimes you're having such a blast you barely realise when the weekend has come and gone *because everyday seems like the weekend! * and that the summer has zipped past so fast it just seems like a blur. All you can do, is live in the moment and have as much fun as you can possibly have. Sing. Dance. Cry. Laugh. Kiss. Shop - Do whatever it takes to make this summer one that you will never forget.
" You will never be old and wise if you were never young and crazy. " Outfit: Crotchet Blouse - Hand me down, White tank - United Colours of Benetton, Black high waist shorts - Next (London), Black Wedges - Ginger, Silver braided hairband - Self made, Glitter purse - Vintage + Self modified. One fine sunny afternoon, I had a family lunch. And what says 'summer afternoons' more than creamy crotchet! Throw in a pair of high waist shorts, wedges and a dainty hair band and you're good to go! Hope the week started off well for you - I've got a jam-packed week ahead but I'm sure it'll be great! Have a fab week ahead lovelies ! When I first saw this project being mentioned, it was at So Much To Smile About, an amazing, vibrant blog. And the reason I kept reading on about it was because, it gave such a realistic perspective to the apparent idyllic life of a style blogger. It felt nice to relate to the bloggers that have posted as part of this project and not only peek into their lives but identify with them. So after a fair share of reading these posts and being a little nervous about doing this, here goes nothing. * I am not always this put together : I'm not always smiling and optimistic - I try to be but I have my grumpy days too. Often enough, I step outside without even a stitch of make-up - not even a swipe of lip gloss. I do have insecurities about my looks but during the past year, I've learned that rather than hiding those flaws under coats of foundation, it is better to embrace them and learn to love them. If you ever meet me while I'm street shopping, at a mall or getting an ice-cream, I may probably be in a tshirt and jeans and that is because comfort scores first on my list. * I am not a shopaholic : I have often seen many a fashion blogger describe themselves as 'shopaholics' and there is a common misconception that fashion bloggers are so. I, on the other hand, do not consider myself as a shopaholic. I enjoy shopping and the word 'sale' makes me do one helluva happy dance but truth be told, I do not drown myself in shopping at every opportunity I get. And every once in a while, I do go along with the impulse purchases * Read: Fancy, pretty shiny things ! * I just find it better to spend wisely rather than be broke and worried at the end of the month. * Numbers are not a priority: I believe in writing interesting content and providing good pictures to the audience that reads my posts. If they enjoy what I am providing, I would be more than delighted for them to follow my blog. If they dont, its ok - Everyone's interest is not the same. At the end of the day, all that matters to me is that I write a good post and that my readers enjoy it. * I am a flats person : On a day-to-day basis, I am on the move constantly - from college, to a lunch to a shopping trip and I just find it so much better to sprint around in a pair of ballet flats rather than balance unsteadily in heels, especially if like me, you also use public transport. I love the heels that I own more than the world, but there are safely tucked away for an event or occasion that I deem suitable. Proof: The number of flats in my closet outnumber the number of heels. So those are my deep dark secrets and honestly, it feels fantastic to share a post like this. 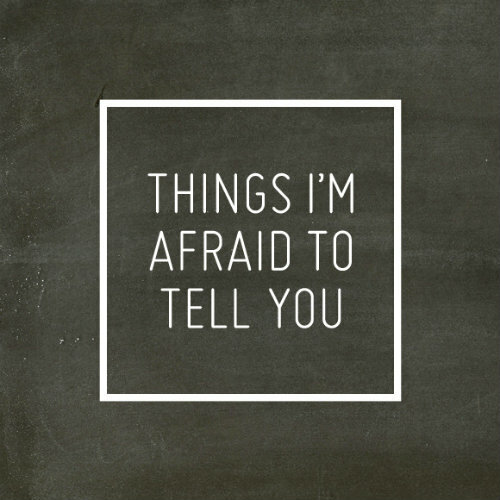 To everyone reading this; if you like the concept of the 'Things I'm afraid to tell you' project, go ahead and get down to posting ! What do you think about the post ? I would love to hear your feedback ! Have a great weekend ahead my lovelies ! If there is one outfit I have always wanted to wear, it is a white-on-white one. I've mentioned it before but I've always been too afraid that I'll end up looking like Morgan Freeman in Bruce Almighty *yes I have fears like that* But on this particular day, everything be damned and I jumped in with in this outfit, wholeheartedly. Now I could continue about how white is so perfect for the summer but I'm sure thats all you have been hearing about this season. What I will go ahead and say is, sometimes no matter if you are looking like Mr. Freeman or absolutely ridiculous; it feels nice to let go of your inhibitions and just dress to make yourself happy. Whatever the turnout of the outfit is and whatever people may say about it, you feel good about it and that's what matters most of all. Outfit : Sequin embellished tank - Gifted, Linen trousers - United Colours of Benetton, Tan sandals - Catwalk, Gold bangles - Thrift (Colaba), Gold watch - Vintage, Gold hairband - Self made. Gold and white, an eternal combination and one I have never explored before just goes so excellently together. The high bun updo is perfect for hot days like these - throw in a pretty hairband and you're all set ! The one trend at the recently concluded MET ball that I noticed is dark lips on Lana Del Ray and Camilla Belle. I love bright, happy colours in terms of lipstick but I said, since I'm going all out with this outfit - why not go for a mocha shade on my lips too ! My week has been crazy busy but so exciting ! With so many good things coming around me, it justifies my belief in the quote 'Good things come to those who wait'. So even if your feeling glum right now, don't worry, the best part might be just around the corner ! Have a lovely week ahead my dolls ! DIY | Glitter bag accents. I love me a good DIY project. Nothing feels as good as sprawling on the floor wearing a stained apron alongside tubes and bottles of paint and what-not. Since summer vacays are going on currently, the best activity to keep you busy and productive is a DIY project where you can make something at a quarter of the price! So you've got an old bag which you refuse to throw away but want to give a little pick-me-up so you can start using it regularly - this project is just for you. One which you don't have much use for would be best. You get options in fabric glitter like silver, bronze etc. I chose gold. Depending on the area you want to paint, choose the size of your brush accordingly. In case you are unable to buy fabric glitter, don't worry because it is so easy to make some. Loose Glitter is available at any stationary shop in insane colours like red and blue too! I bought an unecessarily large packet - a smaller packet will suffice. Fabric Glue is also widely available at any stationary shop. Using the disposable cup, mix together equal propotions of Fabric Glue and Loose Glitter. In case you have extra mixture in the end, store it in an air-tight bottle and you can use it for tonnes of other projects. Now with all you items ready at your disposal, paint the accents of your bag (which ever part of the bag that you want to have glitter) After painting one coat, leave it to dry for a minimum of 6 hours. If you feel your bag needs repeated coats, repeat the procedure. Depending on the thickness of the glitter glue, you will have to see how many coats it takes to completely cover your bag. The ready-to-use gold glitter glue which I used on my bag is a rather thin mixture and took me 3 coats to cover. But if you use the hand-made mixture of the loose glitter plus the fabric glue (which is awesome by the way), you will need probably just a coat or 2. This is the end result of the bag I painted and I absolutely love it! It is a water-proof tote so I've mentally decided to use it especially during the monsoons. My week has been so great ! I've got an amazing project in the pipeline which I am working on currently so it has been a busy one. Thank God It's Friday, right ? Have a great weekend dolls! Will be back sooner than soon! Don't go breaking my heart. There is something magical about a strong gust of wind on a scorching summer day. I've complained a gazillion times when I was going somewhere and a strong breeze has upset my hair which took me so much time spent at the dresser to do up. But with weather like this when it is so excruciatingly hot, some cool breeze is just what I need. So when these pictures were shot on a particularly windy day, I had no clue that the otherwise infuriating wind could prove to add a nice touch to these pictures. Take a look. Jeans in summer are a big no-no for me. So on a day when you have to dress in a particular way, chinos are the best alternative - they are so light and breathable. Of course if you have a choice of what you can wear, turn to your dresses and skirts ! 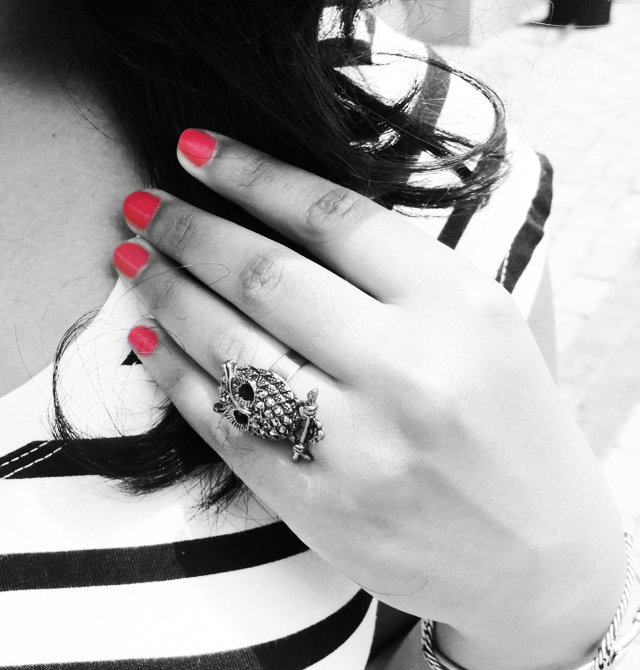 I always like a good pop of colour which the blue nails and the coral lipstick add to this look. So summer tip #148 - Go light nd enjoy the breeze while you can. I've got a few projects to do this week, and maybe a DIY. How are you spending it ? Have a great week dolls ! Coachella, an annual music and arts festival which took place during April makes enormous waves all over the media every year. Apart from the impressive line-up of performers and artists, Coachella is become more than just a music and arts festival, it has practically become a culture. And the fashion! 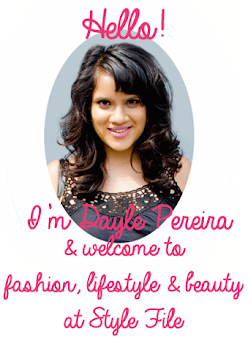 *that was what I was building up to* The fashion is light, breezy, summery and gorgeous. It is nice to see even celebrities dressed down to shorts and a tee, but in the chicest way possible of course! A little bit of me feels rather silly because this post is late but I just have to share some of my favorite looks at Coachella. Here, take a looksy. These pictures display the fashion that was at Coachella during that week - tribal prints, pastels, denim cut-offs, sheer fabrics, bright colours and lace. My favorite outfit from all the above is this last one with Vanessa Hudgens - I love how chill she looks in that crochet halter with barefeet! And Katy Perry's violet locks - so pretty! So how about you - did you keep a track on the fashion at Coachella this year ? And what is your favorite outfit from the post ? I had a great relaxing week spent with maximum time spent on catching up to speed on posts and work. I do hope May started off well for you too ! Its that time of the year again. The chilled lemonade glasses are getting bigger, you won't step out of the house without a dollop of sunscreen and your clothes have gotten comparatively smaller. You know its true. And you know it is summer. Every summer has always meant, me doing practically nothing, spending most of my waking hours on the internet and prancing outside in the sun. So much so, that when April rolls around, I'm mentally prep'd about what the next 2 months in going to entail. But no, not this time. This time I'm going to do it differently. I'm going to spend a little more time doing something more productive rather than checking twitter updates, I'm going to channel my creativity and in the trend department, I'm going to try something new. At least, that's what I'm going for. Make-up: Eyes - Maybelline Eyestudio drama gel liner, Lips - The Body Shop 48 , Nails - Colourbar Exclusive 44. Have you ever tried your hand at print-mixing ? Well this is first time for me! And with the Indian Fashion Bloggers Floral Remix, I decided it would be great to mix it up with some flowers and stripes. Have you tried anything new lately - a new flavour of ice-cream or a lipstick in a shade that you would never imagine ? If you haven't, I'd suggest you should. What is life without a little variety, eh ? Happy May Day folks !